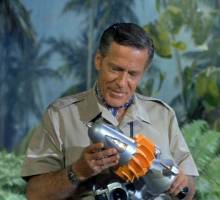 Bainbridge Wells' inflated ego drives his "science" oriented TV series; he's at Murro atoll tracking down a creature reputed to exist in the area, and his foolhardy approach gets his camera crew killed by a monster when he brings it to the surface with an ultrasonic lure. 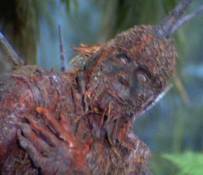 When the creature attacks, he hurtles the lure at the feet of his camera crew and runs off to hide in the bushes; the crew members are all killed. 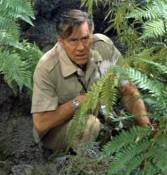 Wells hides in the bushes. Wells manages to get a photo of the creature as he hides behind a bush and later surfaces at NIMR, claiming his camera crew died because they panicked and were killed through no fault of his own. 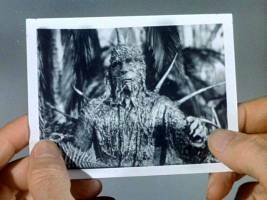 With photo in hand, he convinces Nelson to go after the creature. This Nelson does in spite of his own revulsion at Wells' self-aggrandizement and questionable scientific passion. When news of the sailing gets out, Patterson, who had been cleared for emergency shore leave, announces he's canceling the leave and will be sailing with the crew. 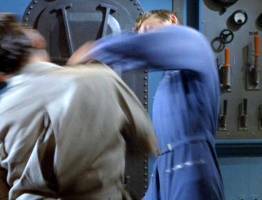 The truth is, Patterson's father was one of Wells' camera crew killed in the island incident, and Patterson is convinced that Wells is lying; his father never would have panicked; Patterson intends on retrieving the film case Wells claims was lost in the water during the attack. 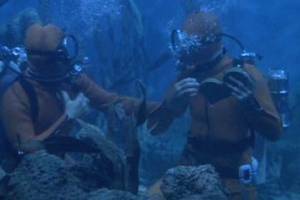 Upon reaching the atoll, Patterson and Kowalski set out on a dive to find the film case. 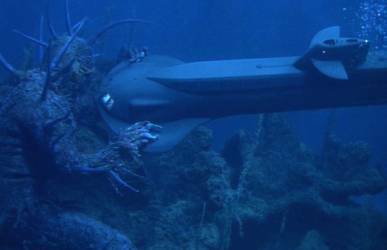 During the dive, a creature 30 times the size of the one that attacked Wells approaches Seaview. 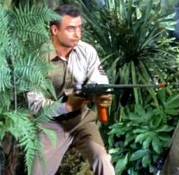 Kowalski and Patterson are ordered in, but Pat, intent on finding the film, lingers, and finally does find the film just as he and Kowalski are attacked by the smaller creature. Meanwhile, Seaview is attacked by the big monster and shoved to the bottom. The two divers are retrieved just in time and Seaview surfaces. Patterson turns the film over to Nelson, who, assuming it's ruined, turns it over to Wells. 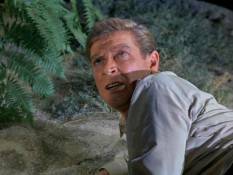 Wells convinces the Admiral to approach the atoll and send a party ashore so they can find the smaller creature. 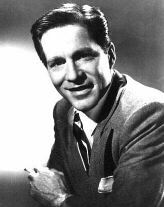 As Nelson, Kowalski, Sharkey and Wells go ashore armed with the lure and stun guns, Patterson, a film expert of sorts himself, sneaks into Wells' quarters and confiscates the film case and sets about salvaging the recorded images. 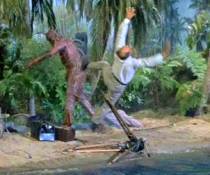 On the island, the monster attacks and is stunned into submission by Sharkey, even as it's about to kill Nelson. 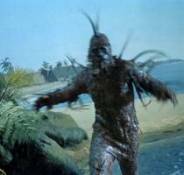 The shore party returns to Seaview with the sedated creature, whereupon Patterson confronts Wells with the restored footage showing clearly that it was Wells who caused the death of the camera crew when he tossed the ultrasonic lure at them as the monster attacked. 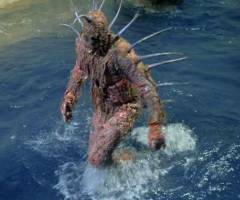 A fight ensues, Patterson is knocked unconscious, the creature awakens and kills Wells. Wells tries to buy off the accusing Patterson with money. Pat, will, of course, have none of that! Using the lure, Nelson eventually attracts the creature to the pressurized sea hatch, tosses the lure into the sea, and the creature follows. Wells is dead, and Patterson at peace, having vindicated his father. Nelson implies, ironically, that by the time his press agents get through with the story, Wells will probably look like a scientific hero. 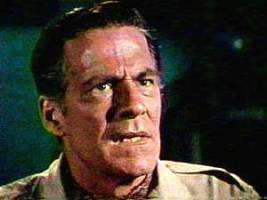 Mark Says: This "black lagoon" redo is exciting, with Hugh Marlowe giving a likeably earnest performance as Dr. Wells. However, it�s the monster that makes the show. It looks convincingly menacing, especially when it peers though the Seaview�s observation windows. One of year three�s best shows. Mike Says: It's not badly written, it's excellently directed by Alex March, and the music cues (mostly by Jerry Goldsmith from Jonah and the Whale) drive this episode straight forward. The script itself offers constant forward story movement, something which many later season Voyages lacked altogether (how many episodes can you recall where Nelson or Crane attempt to use the Flying Sub to effect a rescue, only to fail and have to return to Seaview having effected no story progress other than to eat up broadcast time?) Normally I don't like rubber-suited monsters, but this one, especially the miniature effects work of the giant creature and Seaview, works pretty well.